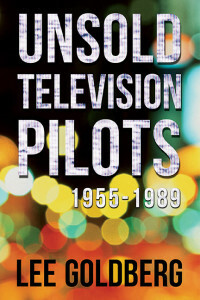 My book UNSOLD TELEVISION PILOTS 1955-1989 is back for the first time ever as an ebook (for Kindle, Apple, and Nook) and as a single volume trade paperback. I began writing it when I was nine years old. By the time I finished it, I was in my early twenties and was far enough along in my TV career that one of my filmed, unsold pilots actually became an entry in this book (If You Knew Sammy, a potential spin-off from Spenser: For Hire). I appreciated the irony. It somehow seemed fitting. The book was written in those dark ages when information couldn’t be Googled….when research meant spending thousands of hours in libraries, going through books, magazines, newspapers, and microfiches (remember those?) and digging through dusty file cabinets. At the time, unsold pilots were a mystery, and there was no single resource for finding out information about them. This book became that resource. It was the first compendium of its kind. And to my shock, and delight, the book became a sensation when it was published, leading to scores of articles, national TV interviews, a paperback abridgement (since republished as The Best TV Shows That Never Were), and over the years not one, but two network TV specials, The Greatest Shows You Never Saw (which I produced) on CBS in 1996 and The Best TV Shows That Never Were (which I wrote and produced) on ABC in 2004. The biggest thrill for me, though, was sitting in the audience of The Tonight Show with my wife Valerie while Johnny Carson, a certified TV legend, held the book in his hand, talked about how much he liked it, and then did a comedy bit based on it. Over the years, readers have alerted me to mistakes in the book… the most embarrassing of which were the inadvertent inclusion of a few pilots that actually did sell and became series. Cringe. I’ve deleted those entries from this edition but made note of them to preserve the integrity of the original index (the pilots are listed by entry numbers, not page numbers). I’ve also received hundreds of letters and emails from many attentive readers, who corrected errors, gave me additional details on dozens of pilots and alerted me to some unsold pilots that I’d missed. I’d like to single out Barry I. Grauman and Bill Warren for their eagle eyes and keen knowledge of television. I’ve corrected most of the errors in the book (I say most, because I did my best to get’em all but I’m sure I missed some) and added some of the new details. However, I haven’t added any substantive new material. The few unsold pilots that I missed in the book have since been noted in the other reference works on the topic that followed mine over the last twenty-five years. Oh, who am I kidding? The truth is, I didn’t add any new stuff because that would be the path to madness for me. I wouldn’t be able to stop until I brought the book entirely up-to-date, adding all of the unsold pilots produced since 1989. I’ll share with you my dark secret. Since the day I finished this book, I’ve continued to compile information for a follow-up edition and possible new TV specials. I’ve transferred all my old VHS tapes of unsold pilots to DVD…and I grab any new unsold pilots I can get my hands on or that I can record off-the-air. I still clip, literally and virtually, every article that I see about pilots-in-development. But in this age when it’s so easy to find information on the web, when everything is databased (including, probably, every word of this book), it becomes increasingly unlikely that I’ll ever write a sequel to this book covering 1989-to-present. And yet… I keep gathering the information. So why do I do it?